The Vacuum Circuit Breakers (VCB) are particularly advantageous for use in the voltage range 3 kV to 38 kV. In the Vacuum Circuit Breaker the arc interruption takes place in vacuum in the interrupter. The pressure inside the vacuum interrupter is maintained below 10-4 torr. At this low pressure very few molecules are available inside the interrupter chamber. This is one desired characteristic of the interrupting medium for more efficient arc quenching. For opening the circuit breaker, the operating mechanism separates the moving contact from the fixed contact inside the interrupter. Just at the point of contact separation, a very small amount of metal vaporizes from contact tip and arc is drawn between the contacts. Current flows between the contacts through this arc. Due to the sinusoidal nature of the AC current, the current after reaching the maximum value decreases so reducing the vapour emission. Near zero value of the sinusoidal current wave the arc is extinguished. The metal vapour is deposited on the condensing shield (see Fig-A). 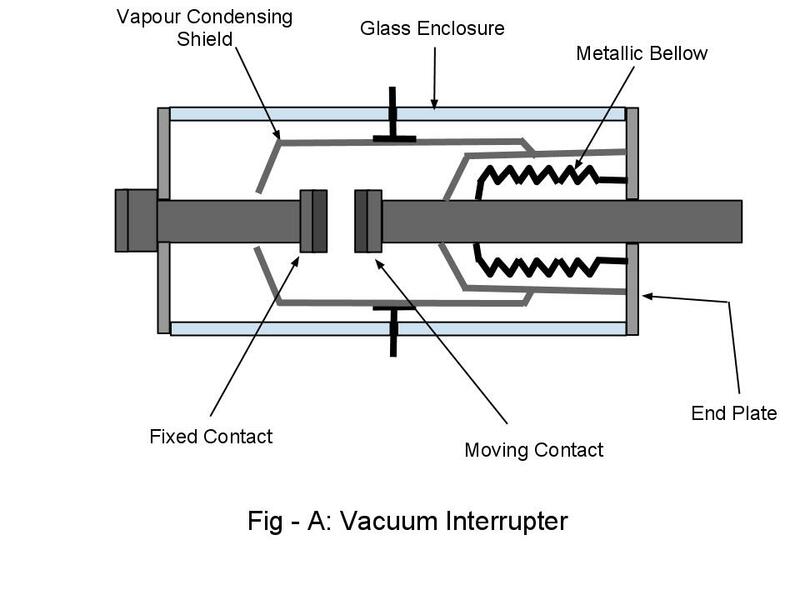 The space inside the interrupter being high vacuum, very little ions are available between the electrodes/contacts. So after arc extinction the space between the contacts regains dielectric strength very rapidly which is the most desired characteristics of the arc quenching medium. Due to the rapid regaining of dielectric strength of vacuum inside the interrupter the re-striking does not takes place. In the figure below is shown the main constructional features of a Vacuum Circuit Breaker (VCB). The vacuum condensing shield is used so that the metallic vapour does not condenses on the enclosure glass. In the absence of the shield the metallic vapour condenses on the glass and gradually the glass becomes conducting, so that the insulation between the moving and fixed contacts is lost in the open condition of the breaker. The metallic bellow makes it possible to maintain vacuum inside the interrupter chamber while allowing the movement of moving contact for separation from the fixed contact. One side of the bellows is welded to the moving contact stem as shown while the other side is welded to the interrupter end plate. The contact surface is so designed that the arc between the contacts diffuse. The arc spread to the sides of the contact surfaces. Diffusion of arc reduces its strength hence the arc quenching is facilitated. The main requirements of the contact material is, very high electrical and thermal conductivity, low contact resistance and high melting point. The vacuum interrupters have long life. Unlike oil CB (OCB) or air blast CB (ABCB), the explosion of VCB is avoided. This enhances the safety of the operating personnel. The vacuum CB is fast in operation so ideal for fault clearing. VCB is suitable for repeated operation. 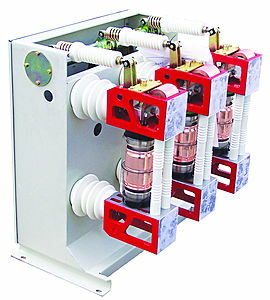 Vacuum circuit breakers are almost maintenance free. Due to the rapid gain of dielectric strength of vacuum interrupter, the separation required between the moving contact from fixed contact is of the order of few millimetre. This makes the VCB compact. No exhaust of gas to the atmosphere. The main disadvantage of VCB is that it is uneconomical for use of VCB at voltages exceeding 38 kV. The cost of the breaker becomes prohibitive at higher voltages. This is due to the fact that at high voltages (above 38 kV) more than two numbers of interrupters are required to be connected in series. Advance technology is used for production of vacuum interrupters. More over the vacuum interrupters production is uneconomical if produced in small quantities.Vacuum interrupters are used in metal clad switchgear and also in porcelain housed circuit breakers. Vacuum interrupters have been successfully used in some countries for circuit breaker rating above 132 kV. The interrupters of a three phase vacuum CB is shown below. A vacuum circuit breaker is a type of circuit breaker where the arc quenching takes area in vacuum medium. The operation of switching on and final of present day carrying contacts and interrelated arc interruption takes place in a vacuum chamber within the breaker that's called vacuum interrupter. Thank you for advantages and dis advantages.